Other than Dracula, I still hadn't seen all the classic Universal Monster movies. I've watched a little of The Mummy and Creature From The Black Lagoon, but nothing ever stuck with me. 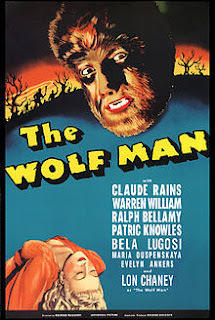 Finally I decided to give The Wolf Man a shot and while it's a different style than I'm used to, being from the 1940's, but I still really enjoyed it. It had the classic vibe that makes the experience good no matter what the content on the screen is. That said, it's a classic story that I'm glad I was finally able to see fully formed. I just kept comparing it to the remake because sadly I saw that one first. The only problem I really had with this is how the Wolf Man acts. He just kind of looks like a guy in theater, over-exaggerating every gesture and making the performance more comical than scary. But again, that's just a product of the times, so I can't really fault the film for that.